Sometimes people ask ‘why do you do running?’ One answer is that it is an inexpensive sport – all you need is a top, some shorts or leggings and a pair of trainers. Well, that’s what it USED to be like. A few years ago I bought my wife a great Christmas present, is was a (then) unusual piece of tech that comprised a stop watch and a GPS location device into one wearable unit (which doesn’t look like a 1970 wrist radio), a Garmin Forerunnner 305! This was a great innovation in that it could tell you not only how long you had run, but how far as well. Better than that, it could even track your heart rate and then upload everything to your computer for careful analysis. Of course, it seems like everyone has one today and companies like Garmin and Tomtom are creating more and more features. Now you might ask the question as to whether training actually counts if it hasn’t been logged on GPS and uploaded to Strava! What people also forget (or maybe don’t really know) is that the distance logged on your Garmin is only an approximate figure; it calculates your location every so many seconds and then joins the dots to create your route and distance. Little wonder your watch often says the distance is up some way from the official end of the race. A nasty surprise if you believe your watch’s pace estimate and have been pacing yourself accordingly. The website for one race I saw had a special section on this subject to head off complaints from runners that the course distance (which has been carefully measured with a wheel) was out! I have just invested in a new sports watch that doubles as a general purpose, rather smart looking timepiece that you can wear all the time. It gathers all sorts of fitness related data and gives you reports. Looking at this has reminded me of the real reason I would say it is good to take up running. One of the things measured is my heart rate and according to the stats my resting heart rate is one of an “athlete”. 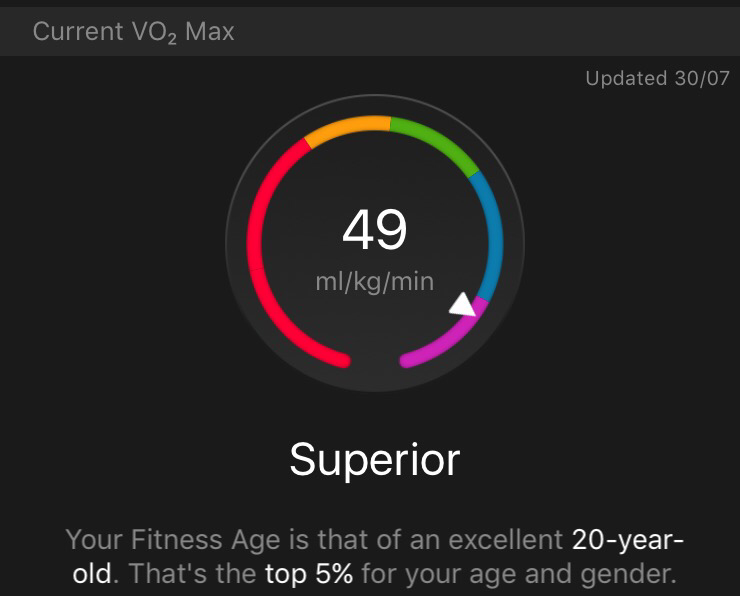 Also using my heart rate, it estimates a thing called VO2 Max, which is to do with the amount of oxygen taken on board during exercise and is a good overall fitness measure. Now, this is something that can only be accurately measured using specialist equipment on a treadmill so the watch’s figure is only, like distance, an estimate. Having said all this, the assessment is that I am as fit as an “excellent 20-year-old” and in the top 5% of the general population which I will choose to beleive thank you very much! I don’t think I was as fit as an excellent 20-year-old when I was 20-years-old so even if the watch has rather overdone it on buttering me up, having a good level of fitness for the first time in my life is something very precious and important that running has given me.